At Vintage Rod Shop, we have found that the only way to provide you with the best finished product is to be completely hands on in all stages of the restoration, fabrication, or customization process. Sometimes the only way to get it right is to have patience. Car restoration is not like it is on TV. Sometimes even small projects can seem to take longer than we would like, but speed is never a substitute for quality. It takes time, experience, and access to some of the best sub-trades and suppliers in the industry to provide you with the very best product possible. No matter what service you need performed to keep your vehicle running on the road, we can help. 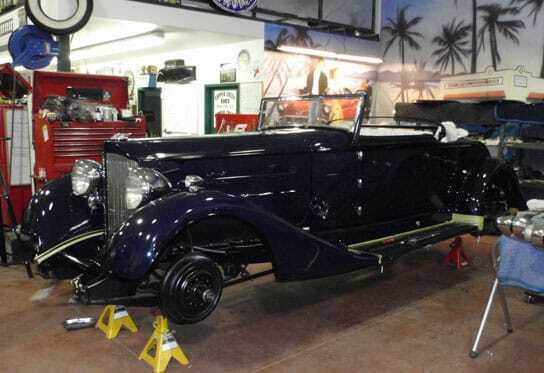 Finding someone to service your vintage vehicle that you can trust can be difficult. That is why we endeavour to establish and maintain an open line of communication with the customer long after the car is finished, entailing years of trouble free motoring enjoyment. We have the ability to recreate many period correct finishes and textures for the automobiles we work on, from raw cast surfaces to engine turning to polishing and paint. Our fully equipped shop for machine work, sheet metal, and casting molds can create any part needed to keep the project moving. 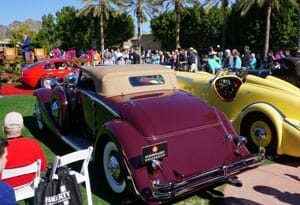 We have extensive contacts throughout the collector car hobby community and can source rare and out-of-production parts and literature for your vehicle. With our fully enclosed and unmarked car hauler, we can pick up, transport, and deliver your project with complete safety and anonymity. No one outside of our team will handle your project during transport, and we offer white-glove service that is second to none. Chassis, suspension, brackets, and interior hard parts can all be fabricated in-house to suit a particular project. From stock replacement to custom work, we do it all. Most early prewar cars utilize wood-body framing under the sheet metal and, in some cases, the exterior material is also wood. Our onsite wood shop is able to replicate everything from a single piece to the entire structure, ensuring the exterior sheet metal fits like a glove and enabling a solid foundation, finish bodywork, and paint. Your car is a piece of art. While it could easily be at home in a beautiful showroom or the grass fields of a concours, it is also a car and must perform as such. Many things go into making a car run and drive as if it is brand new. Safety is our biggest priority, so we will ensure that no part is overlooked or left in a questionable state. Your car will run and drive as good as it looks. We also offer pre-purchase inspection and evaluation services, which can help identify any trouble spots in a classic car before you purchase it. In the event that you buy a car at an auction in the USA, our team can provide any minor work that car needs to pass a motor vehicle inspection to be licensed in Canada. Supporting a local plating company that has been in business since 1980, allows us to have great communication, as well as the ability to oversee and check job progress for tight deadlines and fitment concerns. We are fortunate to work with a two talented upholsterers who are trained in old world techniques—horse hair and jute—and we are also in the process of adding an in-house upholsterer to better control wait times. 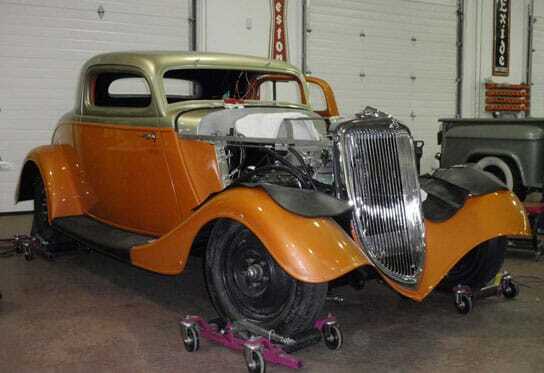 Our machine shop is able to handle anything from Crosley to Duesenberg. All engines are started and run-in on an engine dynamometer, providing us with full control over engine break-in before installation in the vehicle. Quality instruments are the jewelry on your dashboard and need to look their best. We send our instruments to the best in the business and have never been disappointed. Some parts, such as switchgear, door handles, and pedals, suffer badly from heavy wear over the years. We have found an excellent hand engraver who is able to reproduce original textures and finishes for the perfect product every time. Collision shops are unable to provide the quality and attention to detail that our customers have come to expect. That is why we work closely with a local paint shop that only handles custom and classic cars to ensure that you get the best finished product possible. Wood graining is a dying art and, while only a few people specialize in it, we only work with the best. From Fords to Packards, it turns out great every time. Depending on shop scheduling, we occasionally take in modern repairs. It’s not often but, if you are lucky to receive vintage car treatment on your daily driver, your car will thank you. It has become very common for customers, who are looking to make an investment level purchase from $20,000.00 to 2.5 million, to engage us to travel all over the world in search of the best cars. We can handle everything including vehicle research and traveling to a private purchase location or auction venue. Bidding services are also available to customers who would like us to handle purchasing vehicles in a high-pressure auction environment. Our team can take care of everything from vehicle transport and cross-border importation to full restoration or partial repair depending on your particular needs. The needs of our clients always come first.